On this rainy day, I’m glad to be sitting in my office at Banting House National Historic Site of Canada. Things are moving forward as usual. Construction is wrapping up on the porch, the new exhibit is ready to be installed, and I have a healthy to-do list to tend to. But make no mistake: this is no ordinary day. This is my last day of work at Banting House. It’s hard to believe my time here has already come to an end. It really doesn’t feel like it’s been eight months since I first stepped foot in this museum. Readers of the blog will know that I’ve been kept busy by our curator, Grant, with tasks in almost every aspect of the museum’s operation. This has made the time fly, and I’m grateful to have had so many different opportunities to learn and grow. I know this will prove valuable as I complete my Master’s degree and move forward in a public history career. And I will definitely be leaving with a better knowledge of Sir Frederick Banting and his many, many accomplishments. 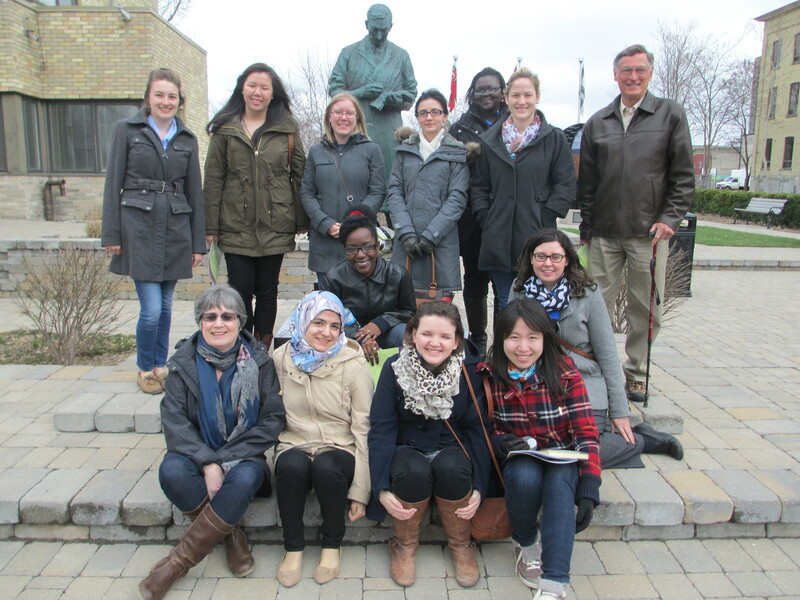 A group of the volunteers and I pose in Sir Frederick G. Banting Square after this week’s luncheon. Thanks for welcoming me into your group this year! This positive experience is one that I know is shared by other Banting House staff and volunteers. I recently had the opportunity to attend a volunteer appreciation luncheon, and it was inspiring to hear about all of the great work being done at this museum, in areas like social media, graphic design, statistics, research, interpretation, and cataloguing (just to name a few). If you’re searching for an opportunity to impact your community in a unique way, I’d highly recommend volunteering at Banting House. I can’t thank Grant, the staff, and the volunteers enough for letting me join them for the past eight months. It was an unforgettable experience! Posted in Behind the Scenes at Banting House.Tagged Exhibit, Exhibits, History, London, Museums, Sir Frederick G. Banting Square, volunteer, Volunteers. Previous Post A (graphic) novel approach: the Banting biography as you’ve never seen it before!